Business News›News›Politics and Nation›Rahul Gandhi to address HAL employees on Rafale. But will they show up? Rahul Gandhi to address HAL employees on Rafale. But will they show up? The interaction has been scheduled at 3.30 pm. Gandhi will speak about how the Centre “favoured Reliance” over HAL in the deal, according to a tweet by the Karnataka Congress. 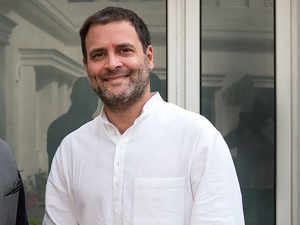 BENGALURU: AICC president Rahul Gandhi plans to address HAL employees at Minsk Square in Cubbon Park, near the HAL corporate office in Bengaluru on Saturday on Rafale in an attempt to step up pressure on the NDA government on the controversial fighter aircraft deal. The interaction has been scheduled at 3.30 pm. Gandhi will speak about how the Centre “favoured Reliance” over HAL in the deal, according to a tweet by the Karnataka Congress. The million dollar question, however, is how many serving HAL employees are willing to attend the interaction in view of the strict conduct of service rules that govern government and PSU employees which bars them from participating any political event or identifying themselves with any political campaign. The defence public sector unit (PSU) has about 20,000 employees, and the employees union has expressed disappointment at having been left out of offset opportunities arising out of the deal. Nevertheless, many staffers may stay away from Saturday’s interaction with the Congress leader in view of the consequences. The HAL management too is said to have warned its employees against indulging in activities that violates their conduct rules. A number of retired HAL employees, however, are expected to turn up, though the attendance of some serving HAL employees who are ready to face the consequences is not ruled. Since Karnataka is ruled by JD(S)-Congress coalition regime, the Congress is expected to ensure the event becomes a success. While Congress is trying to create a buzz in spite of HAL management discouraging its employees from attending the event, the Karnataka BJP tweeted taking a dig at the AICC president. “A prestigious aerospace and defence company like HAL knows for a fact that Rahul is not worthy their time. What can a aerospace company expect from a man who says it should manufacture t-shirts & mobiles. Rahul should limit his speeches only to his cheerleaders,” the party tweeted.